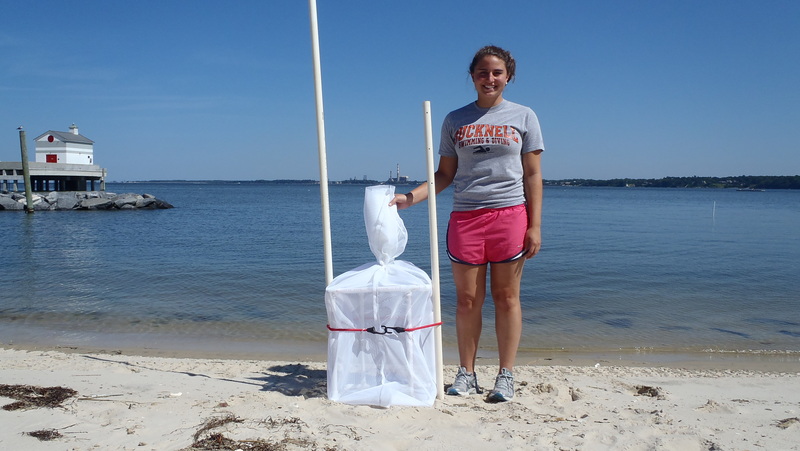 My name is Nicole Rento, and I have been working at the Virginia Institute of Marine Science (VIMS) in Gloucester, Virginia with the ZEN team here this summer. I was born and raised in Virginia about 30 minutes away from VIMS in Newport News, where I attended elementary school through high school with fellow lab intern John Schengber. In a weird twist of fate, we both ended up coming home from our first year at different colleges (him at James Madison University and me at Brown University) to work in the Marine Biodiversity Lab. It’s been great working with one of my oldest and best friends, and making new ones here at VIMS. I just finished my first year at Brown University, and I absolutely love it. I even enjoyed waking up at 6 A.M. most mornings for varsity swim practice, working in the library until late into the night, and especially everything in between. Heading off to college, I was really considering going into the field of medicine. Growing up with two surgeons as parents and listening to their work-related dinner conversations for 18 years, it was hard to imagine doing anything else with my love for biology. Throughout my first semester at Brown, however, I began to move away from my thoughts of becoming a physician and the idea of having to take two semesters of organic chemistry and towards my love for the environment and ecology. And surprising myself by thoroughly enjoying an introductory economics class during the spring semester, I put myself on the path of double majoring in biology and economics. As to where that will take me, I’m not so sure. At the end of the semester I did know that I wanted to start figuring that out. My advisor at Brown (Dr. Dov Sax) knows Dr. Duffy and put me in contact with him. I was delighted when he graciously and enthusiastically offered me an internship here in his Marine Biodiversity Lab. So here I am! I started in May, not sure what to expect nor whether I’d be able to see a path to integrate my two passions (biology and economics). I was introduced to the ZEN project on the first day, and have been working on different aspects of the ZEN projects every day since. The ZEN postdoctoral researcher Pamela Reynolds and the lab manager here Paul Richardson started off familiarizing me with the species we would be working with this summer. 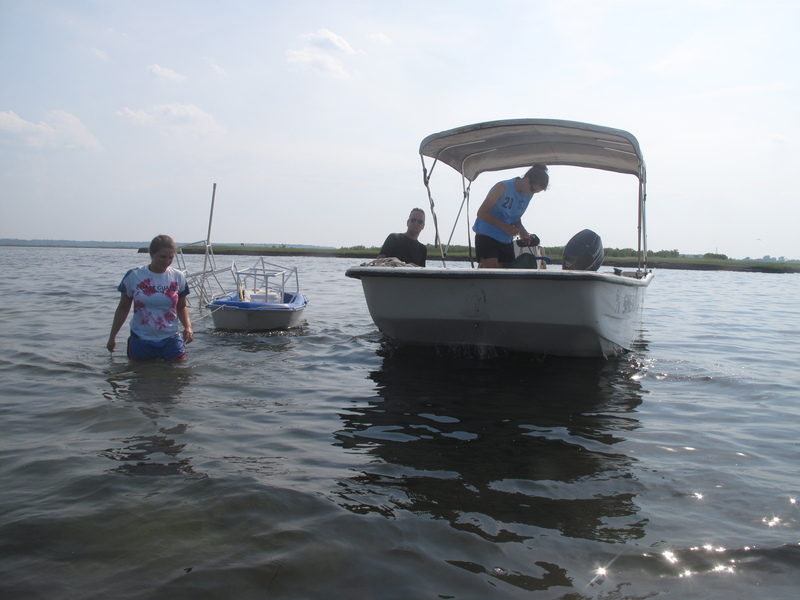 I learned about the biology and ecology of Zostera, the seagrass around which the ZEN project is formed, and all the animals that live within the habitat it forms including blue crabs, pipe fish, amphipods, gastropods, and isopods, to name a few of my favorites. I never thought I would see so many ‘bugs’ in one summer, let alone count and sort all of them. I’ve gotten pretty speedy at identifying these small invertebrate algae eaters. I also never thought that I would become so experienced with PVC piping. One of my first tasks was to help Pamela and Paul design the cages for the predator exclusion portion of the project. Another unexpected job: John and I teamed up to make hundreds of plaster blocks for another part of the ZEN project. There were other tasks such as cutting circles of plastic Vexar, and bending hundreds of wires to be placed in the drying plaster blocks. Plaster, PVC piping, Vexar, wires… all for ecology? Yes. Although the connection was hard to find sometimes, as the cages and materials began to take shape, so did my first lesson in ecology: data don’t come out of thin air. First you have to collect those data, and to do that we had to run an experiment. That step came with trips out into the water – field days. I participated in both the set up and breakdown of an experiment to measure the effects of small predators (crabs, shrimp, fish) on seagrass communities. Working under the sun, holding your breath as we worked to secure our cages in murky water, it was no easy task. But seeing those 30 cages, all designed and built by the lab, helping us answer the important questions we ask with this project, was a feeling of incredible accomplishment for me and for my fellow lab members. After running the experiment there comes countless (often tedious) hours of sample processing. My initial training in identifying seagrass species has come in very handy as we begin examining the final communities from our experimental cages. Finally, after the samples are sorted and the data collected, they have to be analyzed. But we aren’t there yet. I can’t wait to hear the stories from the other sites, and to see what happens as we begin to go through the data from our site’s experiment. 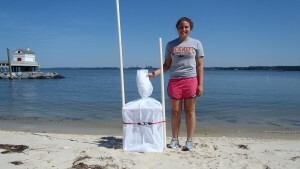 This summer has been a wonderful experience filled with bugs, PVC, great scientists and great friends. Working at VIMS this summer has not only reaffirmed my love for biology, but it has given me insight into the combination of biology with economics. During the summer I heard about other projects that had taken place in our lab and in others. One example was the research our lab did with algae as a biofuel. 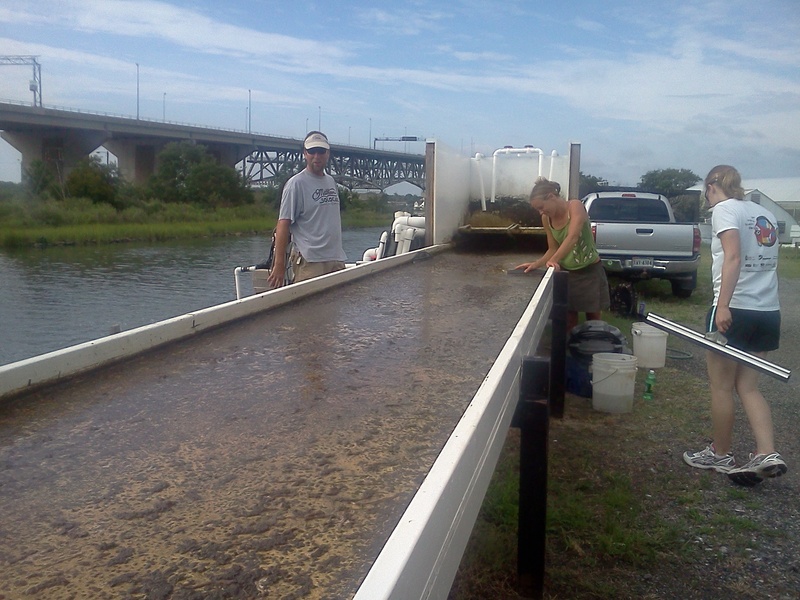 By running river water through giant flow tanks and back into the river, algae was able to grow on the tanks and remove excess nitrogen and phosphorus from the river water as it ran through the tank, returning cleaner water into the river. The algae could then be harvested and used as a biofuel. Not only is this a breakthrough biologically, but economically as well. In theory, if companies were to install these flow tanks in their factories, they could not only create their own naturally cleaner biofuel, but also help to clean river or lake water. Although still in the preliminary research and development phase, projects like these are beneficial to both the economy and to the environment, and I can definitely see myself being involved in similar projects in the future. 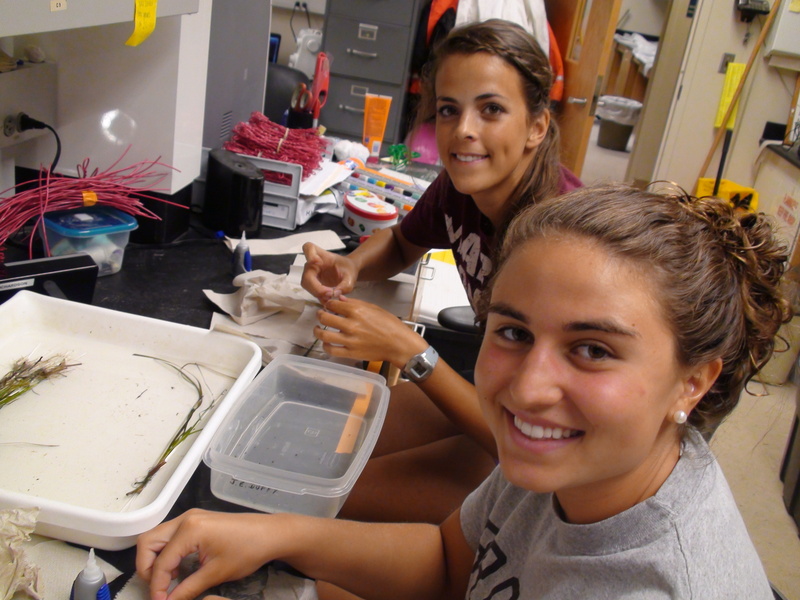 I’m so thankful for having the chance to work with the VIMS Marine Biodiversity Lab this summer. Good luck to the other sites!